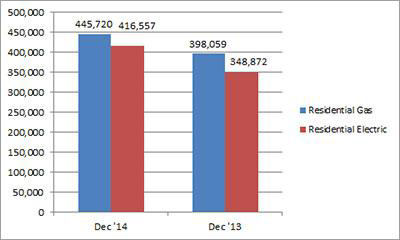 U.S. shipments of residential gas storage water heaters for December 2014 increased 12.0 percent, to 445,720 units, up from 398,059 units shipped in December 2013. 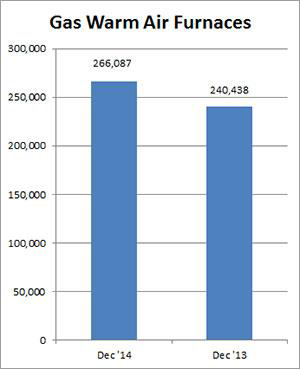 Residential electric storage water heater shipments increased 19.4 percent in December 2014, to 416,557 units, up from 348,872 units shipped in December 2013. For the year-to-date, U.S. shipments of residential gas storage water heaters increased 4.4 percent, to 4,471,903, compared to 4,282,104 units shipped during the same period in 2013. Residential electric storage water heater shipments increased 6.7 percent year-to-date, to 4,277,329 units, compared to 4,008,478 units shipped during the same period in 2013. Commercial gas storage water heater shipments increased 4.3 percent in December 2014, to 8,134 units, up from 7,795 units shipped in December 2013. Commercial electric storage water heater shipments increased 2.6 percent in December 2014, to 6,269 units, up from 6,112 units shipped in December 2013. Year-to-date U.S. shipments of commercial gas storage water heaters increased 6.4 percent, to 94,247 units, compared with 88,539 units shipped during the same period in 2013. Year-to-date commercial electric storage water heater shipments increased 6.2 percent to 73,458 units, up from 69,160 units shipped during the same period in 2013. 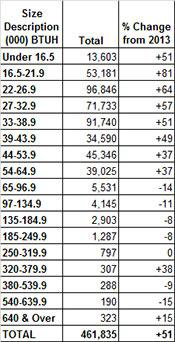 U.S. shipments of gas warm air furnaces for December 2014 increased 10.7 percent, to 266,087 units, up from 240,438 units shipped in December 2013. 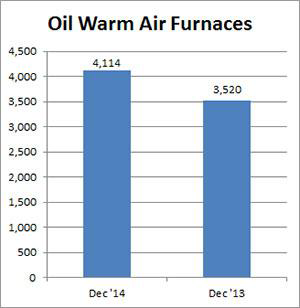 Oil warm air furnace shipments increased 16.9 percent, to 4,114 units in December 2014, up from 3,520 units shipped in December 2013. Year-to-date U.S. shipments of gas warm air furnaces increased 5.1 percent, to 2,734,713 units, compared with 2,601,760 units shipped during the same period in 2013. Year-to-date U.S. shipments of oil warm air furnaces increased 8.0 percent to 34,725, compared with 32,144 units shipped during the same period in 2013. U.S. shipments of central air conditioners and air-source heat pumps totaled 461,835 units in December 2014, up 50.9 percent from 306,141 units shipped in December 2013. 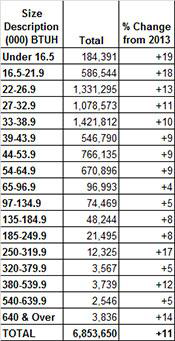 U.S. shipments of air conditioners increased 49.3 percent, to 278,369 units, up from 186,484 units shipped in December 2013. 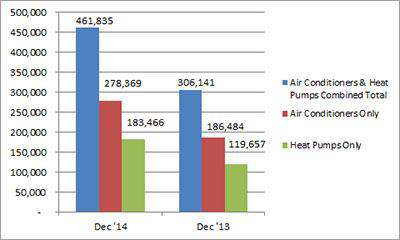 U.S. shipments of air-source heat pumps increased 53.3 percent, to 183,466 units, up from 119,657 units shipped in December 2013. 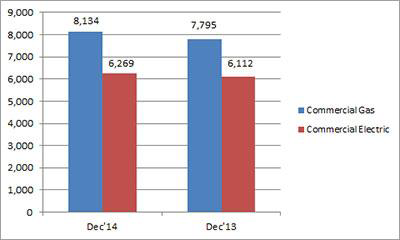 Year-to-date combined shipments of central air conditioners and air-source heat pumps increased 11.1 percent, to 6,853,650 units, up from 6,169,700 units shipped in December 2013. Year-to-date shipments of central air conditioners increased 7.1 percent, to 4,499,660 units, up from 4,201,068 units shipped during the same period in 2013. The year-to-date total for heat pump shipments increased 19.6 percent, to 2,353,990 units, up from 1,968,632 units shipped during the same period in 2013.